What Do Hermit Crabs Eat Every Day? 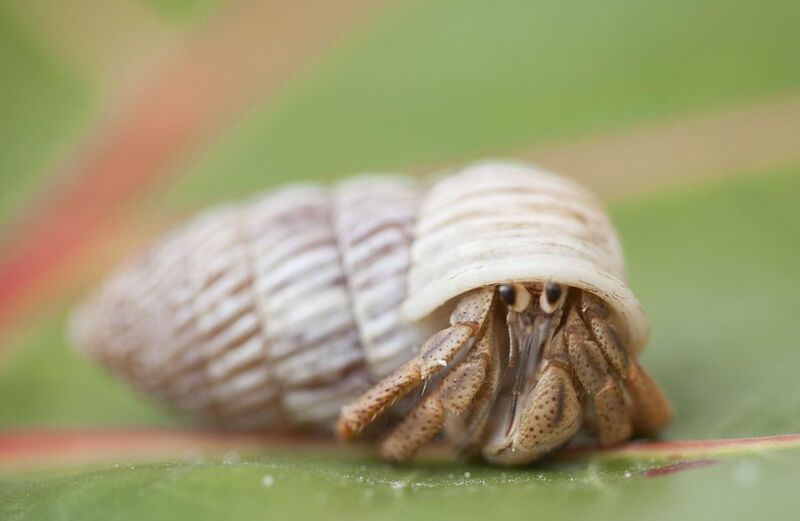 In the wild, land hermit crabs are omnivores, meaning they eat both plant and animal matter. In captivity, their diet should be based on a balanced commercial food supplemented with a variety of fresh foods and treats. There are a few good commercial diets available - depending on where you live it may be difficult to find them at the smaller pet shops, though. Fortunately, there are mail order sources readily available. Florida Marine Research is a good source of time-tested commercial food, as well as treats. Zoo-Med is also another balanced diet from a reputable manufacturer and makes a pelleted diet as well as a canned food to tempt even the pickiest eaters. PetDiscounters.com carries FMR and Zoo-Med foods along with a good variety of other foods. Pelleted foods can be fed once a day, and should be crushed especially for smaller crabs. They can also be moistened if desired. Uneaten food, including the pelleted/commercial foods, should be removed daily. While the commercial diets are convenient and most are quite well balanced, they should be supplemented with fresh foods. Hermit crabs seem particularly fond of having a varied diet. A wide variety of foods from the list below should be offered on a rotating basis (a few each day, then a handful of others the next, and so on). This list is not exhaustive as other similar foods can be fed as well. Pretty much any fruit (fresh or dried) can be offered, although some experts recommend avoiding highly acidic or citrus foods (e.g. oranges, tomatoes). Try a variety of vegetables but avoid starchy vegetables such as potatoes and stay away from iceberg lettuce as it is of very low nutritional value. Crabs may really like salty, fatty, or sugary snacks such as pretzels, chips, and sweetened cereal but these should be avoided. Also, avoid feeding dairy products. All species of hermit crabs should have access to both fresh and salt water. Fresh water is needed for drinking, and most hermit crabs will also drink salt water (some also like to bathe in the salt water so providing a dish of salt water big enough for the crab to get into is a good idea). All tap water must be treated with a dechlorinator (drops available at pet stores) to remove harmful chlorine and chloramines. For preparing the salt water, use a product such as Instant Ocean which is designed to imitate natural salt water. The salt designed for fresh water fish (for treating illness etc.) is missing some components of natural salt water. Never use table salt. The desired salinity of the water is somewhat debated among owners. For most crabs, mixing the proportion of salt and water indicated to produce the concentration for a saltwater (marine) fish tank is probably fine, and the crabs will adjust their intake of salt and fresh water to regulate their salt needs. For food dishes, you will want something shallow, sturdy, and easy to clean. Flattened heavy plastic dishes made to look like rocks can be found in the reptile section, or you can use shallow ceramic dishes made for small animals. Some people also use natural sea shells (the flatter half shells) for feeding. Since all species of hermit crabs should have access to both fresh and salt water, you will need two water dishes. They should be big and deep enough to let the crabs get into them if they wish to soak (especially the salt water dish), but easy to get out of and not so deep that drowning is a risk (strawberry hermit crabs should be given a salt pool deep enough to fully submerge themselves in, but for most species it does not need to be that deep). With deeper dishes, smooth river stones or pieces of coral can be used as ramps or steps for the crabs to get out of the water. ZooMed makes a nice water bowl (Hermit Crab Ramp Bowl) that is attractive and is good for hermit crabs due to the stepped edges for easy access in and out, and their Repti Rock dishes work well too. You should also place natural sea sponges in the water dishes; some crabs will press on these to get water to drink and they help regulate the humidity. Can Hermit Crabs Eat Fruit? Is the Hermit Crab Molting or Dead? What Does a Pet Raccoon Eat?